James Moore Captures His Second Super Seniors Title in Back-to-Back Years! 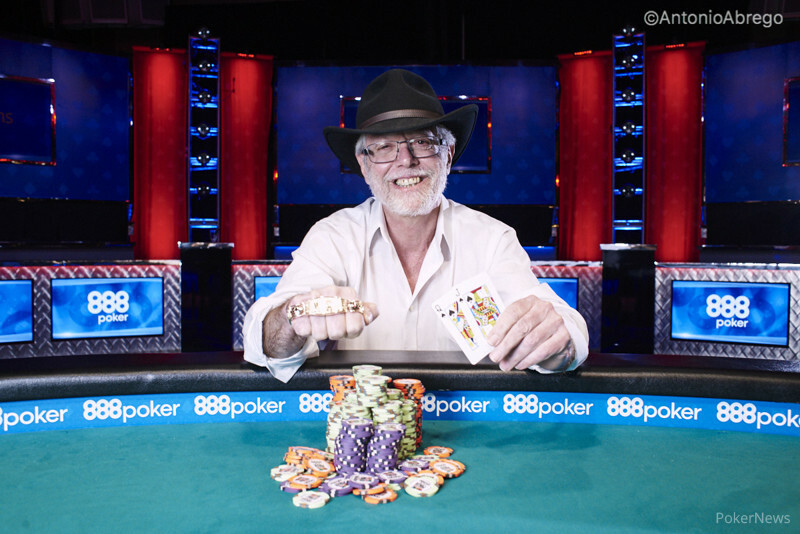 After three long hours and 133 hands of heads-up play, James Moore has accomplished the amazing feat of winning the Super Seniors event in back-to-back years! Today's win earned him $259,230 and a second gold WSOP bracelet after defeating Kerry Goldberg, a worthy opponent in his own right. In 2016, Moore pocketed $230,626, earning himself almost half a million dollars in this event across two series. This event attracted a total of 1,720 entries for a total prize pool worth $1,548,000 paying out 258 spots. The numbers in this event are up from 1,476 entries and a prize pool of $1,328,400 last year, proving that this event is most definitely a successful one. In the final hand, the final two players saw a queen-high flop and got it all in, with Goldberg being the player at risk. He held second pair, but Moore had top pair and they had the same kickers. The turn gave both players two pair and Moore held on to capture a second title in back-to-back years! Goldberg may have fallen short of the title, but he took home $160,120 for his impressive run in this event. Moore is currently a full-time Radiologist just outside of Philadelphia, Pennsylvania even though he is able to work from home. After winning the Super Seniors Event last year, Moore said he felt like he got lucky so he wanted to go out and improve his game. He has played frequently in the Philly area and also attended a WPT event in Atlantic City. When asked what he has done to improve his game, Moore replied with "I am really focused on making the best decisions at any given time. I have become a little bit more sticky on flops, instead of just folding to a bet all the time." Last year was the first year Moore was eligible to compete in the Super Seniors Event and now he has gone two-for-two. "I am shell-shocked at this point," Moore said about his most recent victory. Moore came into heads-up play with a big chip deficit and slowly worked his way into the lead. "Once we got to even in chips, that's when I began to feel more confident." Moore will be returning next year to once again defend his title in the Super Seniors Event and will take his shot at the Seniors Event again as well. "I'm not sure if I will play any other events other than those two - we'll have to see next year," Moore said with a shrug of the shoulders. Going forward, Moore still wants to continue playing poker and continue getting better. "I want to be described as someone with a deep understanding of the fundamentals of the game." This event attracted some big names, and some of the players who went deep today but were unable to make the elusive final table included Armand 'Oyster King' King (29th place $6,535), James Woods (34th place - $6,535), June Jenkins (101st place - $2,025), Michael Shahade (118th place - $2,025), Tom McCormick (134th place - $1,856), TJ Cloutier (174th place - $1,723), and Susie Isaacs (211th place - $1,550). While many players hope to run good and cash in as many events as possible, many accomplished players battled it out but failed to make the money, including Perry Green, Lyle Berman, David Sklansky, Billy Baxter, John Cernuto, and Ron Giles. The official final table of nine lasted seven and a half hours and a total of 288 hands. It began after the elimination of Stanley Siegel in 10th place ($15,804) where he lost a flip with pocket fives against the ace-king of Goldberg. His elimination set the stage for what was an eventful final table. Action began with the first seven pots getting taken down preflop, and then Terry Stahldreher was the first to go in ninth place ($20,296) in the eight hand. He ripped his stack in the middle with ten-five off suit and was unfortunate enough to run into Moore's pocket aces. He couldn't catch a break and made his way to the rail. Almost 20 hands later, Darrell Ticehurst lost his stack to John Isler in back-to-back hands. He first doubled him up after getting his kings cracked by ace-nine suited, and in the next hand moved all in with a flush draw but couldn't get there against Isler's top pair. He battled to the top of the counts at one point, but had to be happy with $46,029 for his sixth place finish. 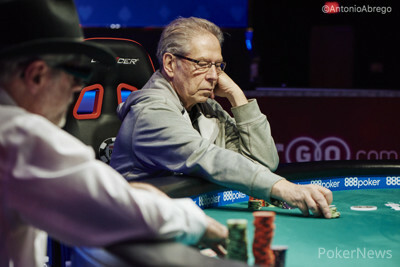 Just ten short minutes later, Ken 'Teach' Aldridge saw his hopes of winning a second WSOP bracelet get dashed after running pocket kings into the aces of Moore. He left the final table with a massive smile on his face, just what he is known for, and shook every player's hand on his way out. He even thanked all of the staff on the floor individually. Aldridge missed two flights in the last two days due to the fact that he kept finding a bag in this event, so it's safe to say he is just fine with his payout of $61,842 for fifth place. Almost an hour and a half of play went by, and by the dinner break, Moore had put together a nice lead with 3,800,000 in chips, while his opponents all had under two million. In just the fourth hand of play after dinner, Veronica Daly flopped top set and decided to slow play it. Unfortunately for her, Moore back into a straight and she called off her stack on the river after Moore shoved. She earned herself the title of Last Woman Standing in this event, and pocketed $84,005 for fourth place. An hour and ten minutes, and about 50 hands, went by before the next elimination, and it was Isler who would find himself flipping with ace-queen against Moore's pocket threes. Moore flopped a set and after getting a count, Isler had just less than Moore and was eliminated in third place for a nice payday worth $115,357. Heads-up play lasted three hours and Moore was the one who eventually claimed his second bracelet in back-to-back wins. It was a special way to end a fun-filled tournament, and there is certainly no reason why this event won't continue to be successful. Thank you for following along with the PokerNews live reporting team. Keep sticking with us as we bring you all of the action throughout the rest of the series. Hand #288: James Moore raised to 300,000, and Kerry Goldberg called. The flop came , and Goldberg shoved all in for his remaining 1,260,000. Moore called, and the cards were tabled. Goldberg was in a dominated position and needed help to stay alive in the tournament. The turn was the , and the river brought the . Goldberg made two pair, but Moore had a better two pair. 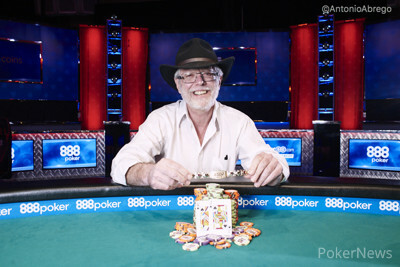 Goldberg was eliminated in second place, and the marathon heads-up match came to an end with Moore as the Champion. Hand #286: James Moore called on the button, and Kerry Goldberg checked. The flop came , and Moore bet 200,000. Goldberg called, and the came on the turn. Both players checked, and the came on the river. Both checked again, and Moore tabled . Goldberg showed to chop the pot. Hand #287: Goldberg limped the button, and Moore checked. The flop came , and Moore led out for 200,000. Goldberg called, and the turn was the . Moore bet 500,000, and Goldberg called. The river was the , and both players checked. Moore tabled for the winning hand. Hand 281: Kerry Goldberg raised to 400,000, and James Moore mucked. Hand 282: Moore called, and Goldberg checked his option. The flop came , and Goldberg check-folded to a bet of 200,000 from Moore. Hand #283: Goldberg called, and Moore checked his option. The flop came , and Moore checked. Goldberg bet 250,000, and Moore folded. Hand #284: Moore raised to 500,000, and Goldberg called. The flop came , and Goldberg led out for 500,000. Moore jammed all in, and Goldberg quickly mucked. Hand #285: Goldberg raised to 400,000 on the button, and Moore called. The flop came . Both players checked to the on the turn, and Moore check-folded to a bet of 450,000 from Goldberg. Hands #275-280: There Was a River! Hand #275: Kerry Goldberg raised to 400,000, and James Moore called. The flop came , and Goldberg bet 450,000 to win the hand. Hand #276: Moore limped the button, and Goldberg checked. The flop was , and Moore won the hand with a bet of 300,000. Hand #277: Moore got a walk. Hand #278: Moore called on the button, and Goldberg checked. Both players checked to the river with the board reading , and Moore bet 250,000. Goldberg called with and had the best hand. Hand #279: Goldberg raised to 400,000, and Moore folded. Hand #280: Moore raised to 400,000, and Goldberg called. The flop was , and both players checked to the turn. Moore bet 600,000, and Goldberg folded. Hand #270: James Moore called, and Kerry Goldberg checked his option. The flop came , Goldberg led out for 250,000, and Moore called. The turn was the , and Goldberg led out for 450,000 this time. Moore called again. The river was the , and Goldberg fired a third barrel worth 1,000,000. Moore called. Goldberg mucked, and Moore raked in the massive pot without having to show. Hand #271: Goldberg called, and Moore checked. The flop came , Moore bet 300,000, and Goldberg folded. Hand #272: Moore called, and Goldberg checked. The flop came , Goldberg bet 250,000, and Moore called. The turn was the , and Goldberg check-called a bet of 400,000 from Moore. The river was the , and Goldberg moved all in. Moore folded. Hand #273: Goldberg raised to 400,000, and Moore three-bet to 1,900,000. Goldberg folded. Hand #274: Moore called, Goldberg raised to 400,000, and Moore folded. Hands #265-269: Stop at the Flop! Hand #265: Kerry Goldberg raised to 400,000, and James Moore pushed all in, getting Goldberg to fold. Hand #266: Moore called on the button, and Goldberg raised to 400,000. Moore called, and they saw the flop of . Goldberg checked, and Moore moved all in, getting Goldberg to fold again. Hand #267: Goldberg limped on the button, and Moore checked. The flop was , and Moore check-folded to a bet of 250,000 from Goldberg. Hand #268: Moore called on the button, and Goldberg checked. The flop came , and Moore made a bet of 500,000 to win the hand. Hand #269: Goldberg limped his button, and Moore checked. The flop was , and Moore bet 200,000 to take down the pot. Hand #260: James Moore got a walk. Hand #261: Kerry Goldberg got a walk. Hand #262: Moore raised to 400,000, and Goldberg called. The flop came , and both players checked. The turn was the . Goldberg led out for 650,000, and Moore mucked. Hand #263: Goldberg raised to 400,000 on the button and took it down. Hand #264: Moore called, and Goldberg checked his option. The flop came . Goldberg checked and folded the second Moore reached into his stack. Hand #255: James Moore limped the button, and Kerry Goldberg checked. The flop came , and Moore bet 300,000 to win the hand. Hand #256: Goldberg raised to 400,000, and Moore three-bet to 1,400,000. Goldberg folded. Hand #257: Moore called on the button, and Goldberg checked. The flop was , and Moore took down the pot with a bet of 200,000. Hand #258: Goldberg limped on the button, and Moore checked. Both players checked the flop, and the came on the turn. Moore bet 200,000, and Goldberg raised to 550,000. Moore tossed his cards away. Hand #259: Moore raised to 400,000, and Goldberg three-bet to 1,000,000, forcing Moore to fold.